Also check out how awesome this poster looks on the wall. 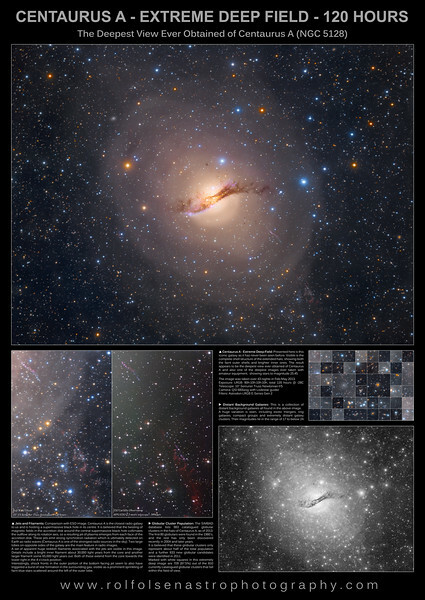 For full details of the images shown on this poster visit the Centaurus A Extreme Deep Field gallery. This image is the realisation of a long time dream of mine: Taking a deep sky image with more than 100 hours of exposure. I set out on this mission in early 2013 and after having gathered 120 hours of data on 43 different nights in Feb-May 2013 I present what I believe is the deepest view ever obtained of Centaurus A. This is likely also the deepest image ever taken with amateur equipment, showing stars as faint as magnitude 25.45. I spent around 40 hours and analysing processing the data, with the goal of presenting this majestic Southern galaxy as it has never been seen before - with all the main features showing in one single image, in order to truly get a grasp of what this intriguing object is all about. A set of enormous reddish filaments associated with the relativistic jets. The complete shell structure of the extended halo, showing both the faint outer shells and brighter inner ones. 709 of the catalogued globular clusters orbiting the galaxy. Integrated Flux Nebulae permeating the entire field of view around the galaxy.